On my recent visit to Portland there were bicycles. Like every place I've visited, people have been kind enough to lend me a bike to get around on. The bicycle above was hand-built by the gentleman above, Tony Periera. He let me borrow the most expensive bicycle I think I've ever ridden for a cycle ride from city hall to the venue where I was to speak that evening. 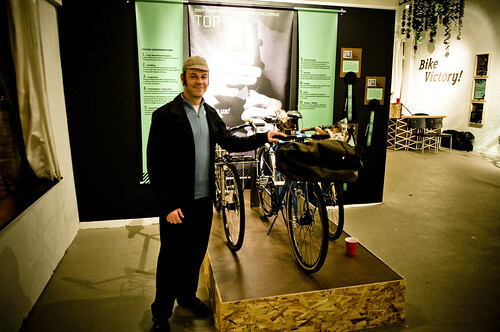 The bike was awarded First Place at the 2009 Oregon Manifest Constructor's Design Challenge so it's not just any bicycle, you see. Tony had the bike up for sale for $6900 and I've just checked his website to see that it's been sold! Whoever bought the puppy is in for a treat. What a wicked ride. Read more about the bicycle on Tony's website. Thanks, Tony! 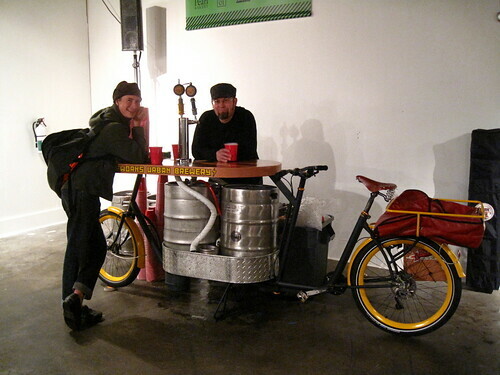 After the lecture I drank fine beer off of this cargo bike with these fine chaps from Metrofiets - Jamie and Philip. Definately a highlight meeting them. At this point I was bicycle-less and needed to get back to the hotel. Here's my ride home. I felt like I was in Copenhagen sitting on the cargo bay and whizzing through the streets of Portland back to the Ace Hotel. "Assumption of Risk: I understand and accept that renting this bicycle and participating in biking exposes me to many hazards and entails unavoidable risk of death, personal injury (including but not limited to severe spinal or head injury and loss of or damage to property)..."
"I realize the importance of wearing a helmet and I hereby commit to wearing a helmet at all times while riding the bicycle. - I understand that this activity may result in severe injury, including but not limited to spinal or head injury." 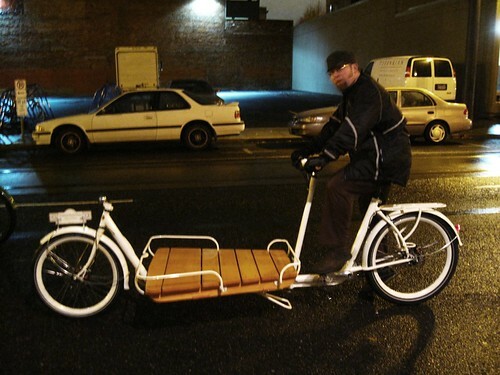 - I understand these bicycles do not have visibility enhancement equipment such as reflectors or lights. Oh goodness me. What a lot of bother and poppycock. Apparently it's okay not to bother with lights and even reflectors. Portland doesn't have a helmet law so I thought it odd that the Ace Hotel tried to implement one. The clerk at the desk also said that the helmets they had were used but they weren't sanitized after each use so I said thanks, but no thanks. In contrast, the W Hotel in San Francisco asked me if I wanted a helmet when I borrowed a Biomega. I said no thanks and he said, "cool" and merely checked a box on the contract saying that I had declined the offer. That's the way it should be. I was off for a bike ride with the head of the DoT Roger Geller and Johnathan from Bike Portland so I kind of needed a bike. A quick phone call to my friend Jay Graves and then we wandered up the street to one of his bike shops - Bike Gallery. There was a Bullitt in the shop but they were keen for me to try a new bicycle from Trek called the Belleville. What a sweet ride. It's all Eco, apparently, but I never did figure out why or how. 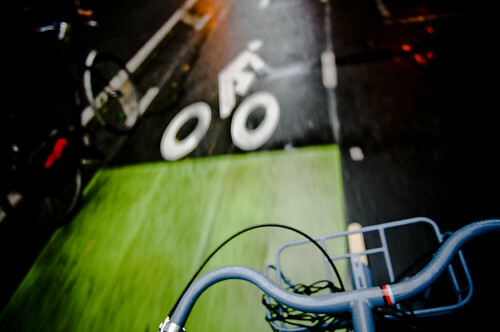 That's part of the bike in the photo above as I rolled happily along the bike lanes of Portland. I have a million things to blog about regarding Portland and San Francisco but I just haven't had the time. I'll get to it. For now, these are the bikes I rode in Portland. I missed out on riding a Bullitt though. A Bullitt owner in the city was willing to loan me his bike but my schedule was so tight and jetlagged that we couldn't swing it. 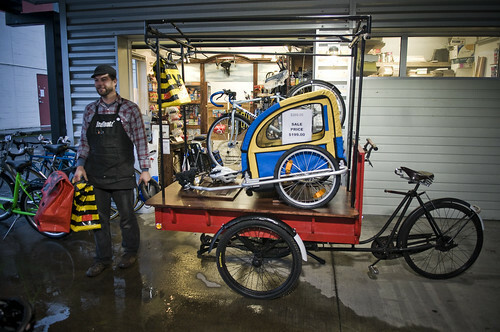 Last by not least, we swung by this gentleman's cool bike shop, complete with a Dutch cargo bike out front. Can't for the life of me find the business card, so please readers, fill me in with the name of the shop in the comments.